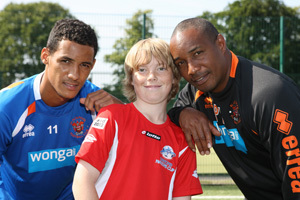 Tom and Paul Ince visit Danone Nations Cup Team England Winners! The countdown is on to the Danone Nations Cup final at Wembley on 7th September! The Danone Nations Cup is a worldwide footy tournament in which over 2 million children compete and, on 7th September, 400 children as part of 32 countries’ teams will get the chance to play at Wembley Stadium in front of international legends including the event’s ambassador Zinedine Zidane! So if you were one of the talented kids to make it into Team England, what better way to get prepared than with a training session from football legend Paul Ince along with his son and current football star, Tommy Ince! The U12 team had the chance to ask Tom about training, how to get ready for big games and playing under pressure. Then, after training, they each got their Team England shirts – how cool! If you want to support Team England tickets are priced at £5 and are now available! As well as a day of football, you’ll also enjoy street dance performances from Britain’s Got Talent winners, Diversity, football skills sessions and loads more fun stuff for families.